In my continuing quest to try out as many different brands of nail wraps, I recently purchased some OPI Pure Lacquer Nail Apps. These were released around the middle of last year. The first thing I found was that I didn't have much choice in the designs I could find. Especially compared to the huge array of designs you can get from the Incoco brand. I found my cheapest option to try these out was to get a set off ebay. The Recommended Retail Price for these here in Australia is $19.95, but I got mine for $7.95. Application was ok. They feel a little thicker than the Incoco, Sally Hansen and OMG strips, but they still were easy enough to stretch out and smooth down onto the nail. 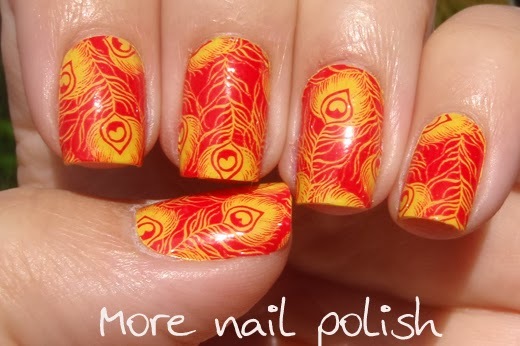 This design is called Peacock and I can't tell if it's a yellow base with red on top or vice versa. 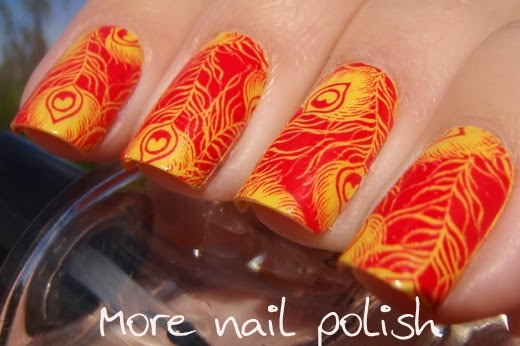 I normally wouldn't purchase a nail wrap that I can recreate with stamping, but I didn't have many choices unless I wanted to drop the full $20 in store on them, and I wasn't doing that. 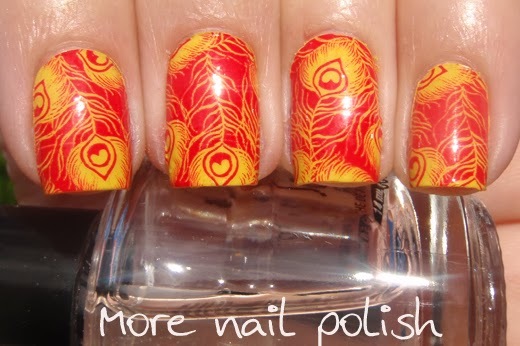 I think this design is definitely something that could be recreated via stamping, especially with all the stamping plates that have peacock feathers on them these days. Most of the online images of this design show it to be a pink and yellow design, not red and yellow, so I was a little shocked when I opened the package and spotted such a bright look. As I did with my previous nail wraps, I gave this OPI nail app and good test out on my right middle finger for a full week. Here is an updated wear test diagram. I was really happy with the wear test on the OPI nail app. In fact so far I've been really impressed with all these strips that I've worn for the wear test. They all hold up really well and only show slight tip wear at the end of the week. 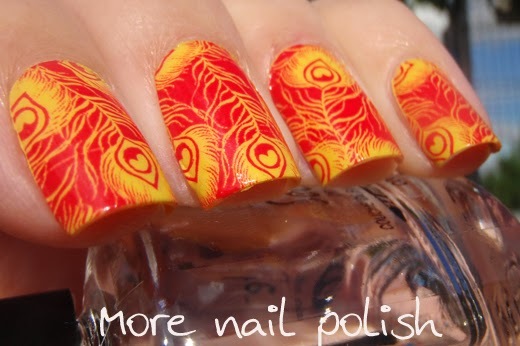 The OPI wraps are good quality and wear well, so if you can find a design that appeals to you at a price point that is ok, then they are a good option. 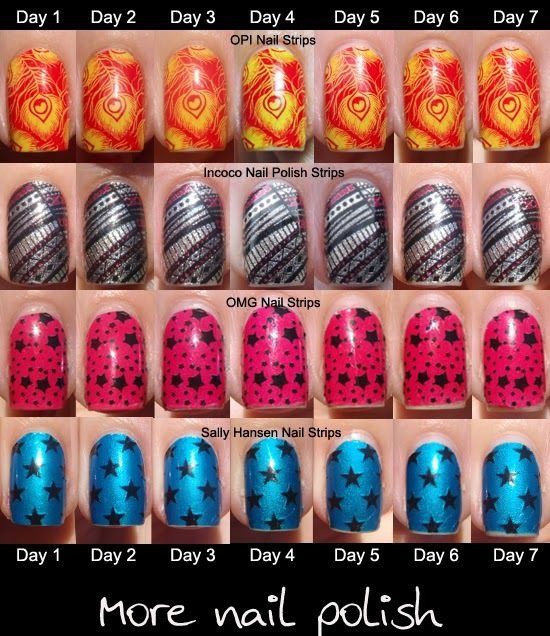 Here is an updated price comparison of the various nails wraps that I have tried. Sally Hansen $14.95 for 16 strips (Australian price at Target), can be found cheaper online - $1.07 per strip. Incoco $9.00 for 16 strips (online price) 56c per strip. OPI $19.95 Australian RRP for 16 strips - $1.24 per strip. Can be found much cheaper online - I paid $7.95 - 49c per strip. OMG Nail Strips $6.89 for 14 strips (online price & cheaper if bundled) 49c per strip. Perl $9.00 for 20 strips (online price) 45c per strip. Ulta3 $5.00 for 16 strips (in store price) limited availability 31c per strip. ALDI $6.00 for 20 strips (in store price) limited availability 30c per strip. Cute design! I have yet to try nail appliques from any company. I love a fellow Aussie Nailateer. This is such a really fantastic comparison!! especially the 7 day photo wear. Thank you for sharing your thoughts. I haven't tried nail wraps yet, but I've been wanting to test out Incoco. I like their designs and I've ready they made with "real" nail polish. Thanks again!! 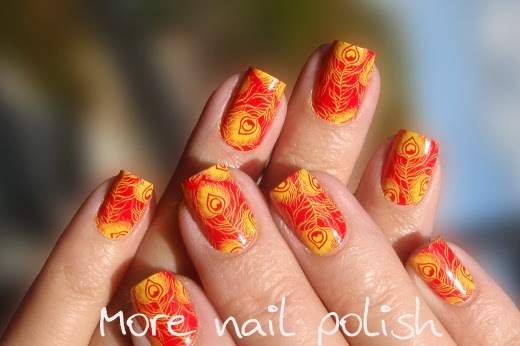 can't wait to see more nail wrap comparisons. I didn't know ALDI sold nail wraps :P I love a bargin! can you review them?? I just tried my first nail strips today by Sally Hanson and was a nightmare! It is very difficult to line them up precisely and they tear so easily. Even though I followed the directions, they started to curl at the edges the very first day of wear. It took a lot of rubbing with nail polish remover to get them off. I think I am going to stick with regular nail polish from the bottle from now on. Much more precise application.